The world of Dark Shadows, created by Dan Curtis, has inspired millions of words -- both fiction and non-fiction -- to be committed to paper over the decades. 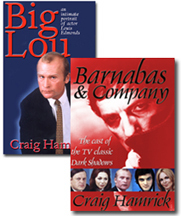 Millions of copies of the DS novels written by Dan "Marilyn" Ross were sold while the show was on the air. And in recent years, several of the series' stars have even gotten in on the act, either writing fiction, or writing about their behind-the-scenes experiences. • An interview with Dan Ross, who used his wife's name, Marilyn, as his penname as he wrote the DS novels. -- The Dark Shadows Novel That "Almost Was"
In the 1960s and '70s, using the pen name Marilyn Ross, Canadian author Dan Ross wrote a series of extremely popular paperback books based on the TV show Dark Shadows. The books featured many of the same characters and settings seen on the show, however they took place in their own "Parallel Time." In the book series, Dan wanted to solve one of the TV show's greatest mysteries -- the parentage of heroine Victoria Winters -- and he outlined a story he intended to flesh out into a novel. However, when actress Alexandra Moltke left Dark Shadows, Victoria was written out of the TV show. At that time, the editors of the book series asked Ross to write her out of the books as well-without solving the mysteries surrounding her heritage. Twenty-five years later, Dan shared his original outline with me. With Dan's permission and input, I used the outline as the basis for a four-chapter novella called The Secret of Victoria Winters, which was first published in the fanzine "Victoria Winters" in 1993. To read the story, click here: Read The Secret of Victoria Winters.